I’m a little late getting this review up on my blog. 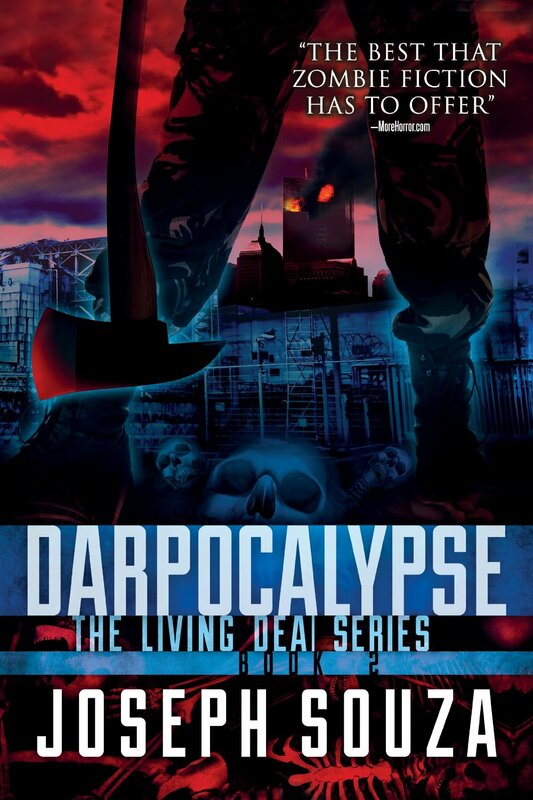 Fans of epic undead action will not be disappointed by Souza’s second installment to his planned trilogy, Darpocalypse. Souza reignites The Living Dead series with the blistering second installment of his utterly unique undead saga. The undead plague, previously seen in its infancy during The Reawakening, has exploded worldwide, catapulting society into utter chaos and destruction. Humanity is reduced to pockets of survivors, desperately hanging on under constant threat of extinction. A rare phenomenon develops during these days…the discovery of humans capable of walking among the dead without fear of attack. Called “Ghosts,” their existence may hold the key to humanity’s survival. The reader is quickly reintroduced to Dar, the unbalanced, teenage zombie-slayer from the first novel. She has taken control of a large group of survivors banded together in Boston, largely thanks to her discovery of Annabelle, one of the extremely rare “Ghosts.” Annabelle keeps the camp supplied, while Dar rules with an iron fist. When I use the term “iron fist,” I do absolutely no justice to the method’s Dar uses to maintain order, discipline and most importantly, obedience in the walled off camp. Think “Mad Max Beyond Thunderdome” meets “Conan the Barbarian,” but ten times more brutal and infinitely more entertaining. Souza brilliantly describes Dar’s antics and the fear she generates, to the point where I was cringing when any of the camp’s inhabitants interacted with her. You could never predict what might happen next, and this is part of the tension that Souza builds throughout the book. The story isn’t limited to Dar’s Boston kingdom. Far from it. Several memorable characters are introduced outside of Dar’s scope, and weaved masterfully into the plotline. A special forces colonel, convicted murderer, and the recently deposed President of the United States all converge on Dar’s domain, in their own spectacular ways, culminating in an insanely spectacular and chilling ending. Darpocalypse showcases Souza’s strengths as an epic storyteller. Strong character development, combined with carefully converging plotlines delivers a tension building knock-out punch when these lines merge for the finale.